On the second Sunday of every month, a group of Irish antiwar and human-rights activists hold monthly protest vigils at a small airport on Ireland’s West coast. The objective? To end the US military use of Shannon Airport and to force accountability from the Irish authorities and political leaders for allowing Ireland—a purportedly “neutral” state—to facilitate American war efforts in the Middle East. A stone’s throw from the Atlantic ocean, Shannon Airport is a small but key transport hub into the west and south of Ireland. The fact that it is located just a kilometer away from residential homes means that its more controversial use is also clearly and loudly on display. Omni Air International troop carriers park at the designated Gate 42 at the end of the terminal building. Travelers mingle with American troops in uniform inside the airport as they wait to board flights. Military planes like the distinctive gray Hercules C-130 aircraft are also easy to spot, parked a short distance from the terminal building and often waiting with a detail from the Irish police and Irish Defence Forces. It’s estimated that about 2.5 million US troops have passed through Shannon since 2002. Now, as Europe struggles to deal with the flow of refugees making treacherous journeys from countries torn asunder by war and sectarian violence, the activists from Shannonwatch, an anti-war activist group, along with some independent opposition MPs have once again tried to spur on the debate over the use of the airport. 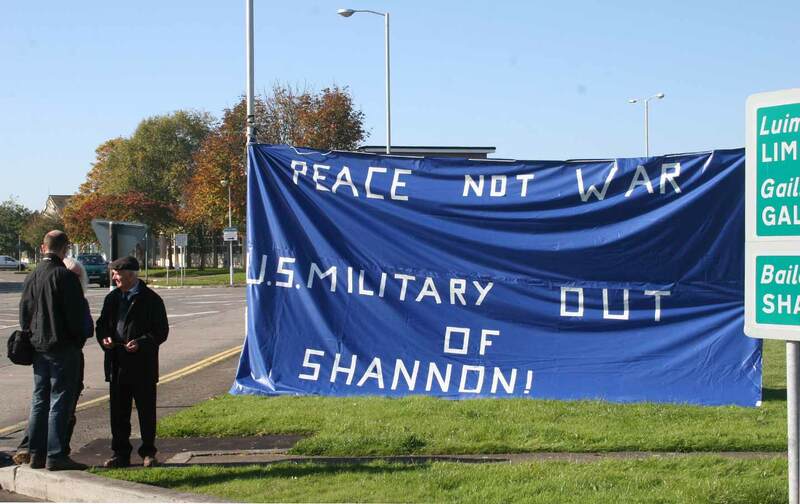 Shannonwatch grew out of activist-led protests against the US military use of Shannon, which began in 2001 in the aftermath of the September 11 attacks, when the Irish government offered the use of the airport to the US government. The protests have continued since then, with Shannonwatch officially forming as an organization in 2008. The group itself is relatively small and does not use a formal membership structure, but garners strength through collaborating with other groups, including the Peace and Neutrality Alliance. During a recent debate over the response to the refugee crisis in the Irish parliament, opposition MP Mick Wallace called on the government to accept that it facilitates the wars that lead to humanitarian crises. The scale of the refugee crisis has taken Europe by surprise, highlighted rifts between states, and left political leaders scrambling. More than 590,000 people have crossed into the European Union by sea in 2015 alone. Last week, up to 85 boats were arriving daily on the Greek island of Lesbos, according to the UN High Commissioner for Refugees. With great difficulty, the EU managed to approve a plan to divide 160,000 asylum seekers among its 28 member states—but this does not even begin to fix a problem that requires a far broader international response. Germany is struggling to receive the roughly 10,000 refugees arriving every day, with officials expecting the figure to top 1 million people by the end of the year. By contrast, under political and media pressure, Ireland has committed to taking 4,000 people over a two-year period. A second opposition MP, Clare Daly—who was arrested last year with Wallace for trying to climb aboard a US military aircraft to inspect it for weapons—made similar comments. Also among those who have been arrested at Shannon is 80-year-old anti-war activist and well-known writer and playwright Margaretta D’Arcy. She was jailed for three months last year after refusing to sign a bond saying she would stay out of unauthorized zones at the airport. The benefits to the Irish government are relatively few. There is a small economic benefit to the airport—but the bigger advantage seems to be the ability to align with the United States and NATO while retaining “neutral” status as a country. The generally NATO-friendly Irish media have for the most part refused to tackle the debate around Shannon head-on. Reports on US military activity at the airport are infrequent, and when they do occur, they usually home in on the novelty of politicians’ and protesters’ getting arrested, rather than ever seriously delving into the issue of Ireland’s complicity in aiding US war efforts. But it’s not just the transfer of troops and weapons that is the problem for Shannonwatch. The organization diligently monitors nearly every US aircraft that lands at Shannon and has deep—and not unfounded—suspicions, that the airport has been used for extraordinary-rendition flights, without the knowledge of the government or Irish people. This, they say, would make Ireland complicit in torture. Over the years, the organization has compiled a comprehensive list of all the planes suspected of being used for rendition flights that have landed in Ireland. The group believes that the fact that oversight at Shannon is so lax means it is highly likely that the airport has been used for this purpose. WikiLeaks cables seem to back this up, revealing deep concerns held by previous Irish governments over whether Washington’s assurances could be trusted. As Europe struggles to deal with the influx of refugees, many have been quick to demonize Eastern European countries for their unwillingness to take people in, but a broader debate must be had—not just about the refugees, who are the symptoms of war, but about the facilitators of war. Each European country must ask itself serious and honest questions about the role they wish to play in the world. It should not take horrific photos of dead children like Alan Kurdi for us to start questioning the wisdom of the policies we’ve been quietly supporting all along. For its part, the Irish government maintains that the state is neutral and that its arrangements with the US military do not infringe upon that status. The fact that Ireland’s neutrality has not been enshrined into its constitution allows for convenient ambiguity.